I AM NOT A CONSPIRACY NUT, BUT I AM ABLE TO IDENTIFY ONE WHEN I CAN ALMOST SEE, SMELL AND TASTE ONE. THE CHRISTINE BLASEY FORD ACCUSATON AGAINST BRETT KAVANAUGH HAD ALL THE MARKS OF AN OBAMA/FBI CONSPIRACY FROM THE BEGINNING. Tuesday, October 9, AD 2018	ART DECO1. Scott Adams has speculated that the scrubbing had to have been done by Google employees. No clue.2. IMO, that CB was recruited by David Laufman via Monica McLean is as good an explanation as any for her conduct. Since she was a period resident of Montgomery County of the right age and social profile, she’d do. If they’d found the sister of a Georgetown Prep alumnus or found an alumna of the school attended by Mark Judge’s sister, the story would have packed more punch, of course. 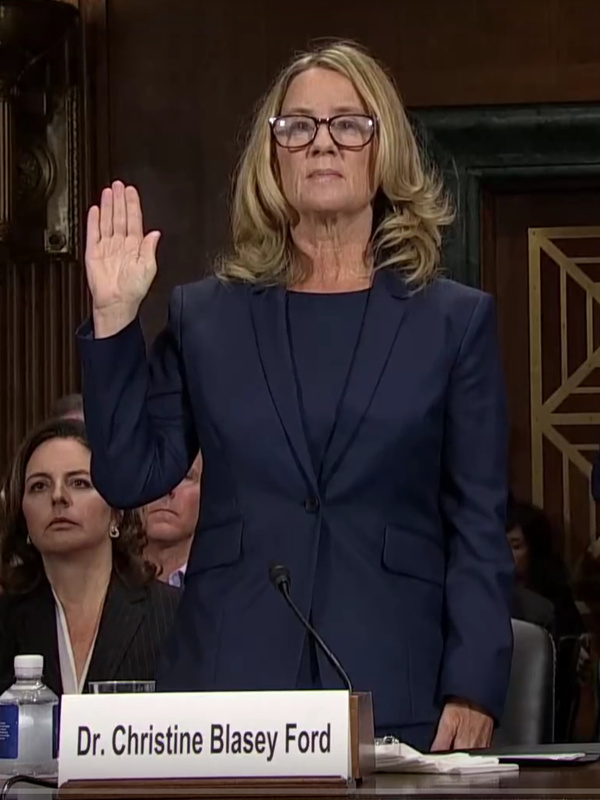 They needed a pussyhat who could hold her own with committee counsel and she was that person, conveniently located in Monica McLean’s circle of friends. Neo-neocon pointed a few days ago to an unnoticed interview with Russell Ford in which he admits she’s been on bad terms with her family the last few years. Tuesday, October 9, AD 2018	PHILIP NACHAZELA set up???? (Major Sarcasm Alert. )Desperate times lead to desperate measures. Tuesday, October 9, AD 2018	YE OLDE SCRIBE“Could Dr. Ford have spent those four days in July helping Christine Blasey Ford compose her letter to Mrs. Feinstein?” I hope he meant Monica McClean, not Dr. Ford. That said, it is beyond me that anyone in their right mind could find this utterly neurotic, and perhaps mentally disturbed woman credible. Then again, it is also beyond me how anyone in their right mind could find modern Democrats credible. 1 Response to I AM NOT A CONSPIRACY NUT, BUT I AM ABLE TO IDENTIFY ONE WHEN I CAN ALMOST SEE, SMELL AND TASTE ONE. THE CHRISTINE BLASEY FORD ACCUSATON AGAINST BRETT KAVANAUGH HAD ALL THE MARKS OF AN OBAMA/FBI CONSPIRACY FROM THE BEGINNING. Did anyone notice how a few weeks ago Obama gave a public speech and since then he hasn’t really been at the front of the headlines. In other words, he has a part to play in all this. On a related note, we need Corey Stewart and we need Catholics to pray that Tim Kaine does not win against Corey Stewart. Tim Kaine has been involved in a lot of evil shenanigans. Playing the “Catholic” card when Corey Stewart is the true Catholic. Obama claims he is a “Christian”. What kind of “Christian” weaponizes the Government and even weaponizes welfare like Obamacare?